In the Eighteenth and Nineteenth centuries architects used to meet their clients carrying catalogues from which they could choose any style or model for their own houses. The same happened with landscape architects, who carried pattern books with many kinds of garden buildings, organized according to their use or their style. In London there was a bookshop, that was also an editor, that specialized in this kind of books, the Architectural Library in High Holborn, run by Isaac Taylor and his son Josiah since 1780. They often published catalogues of their books, so we know many of their titles, among which there are William Chambers' Designs for Chinese Buildings, John Soane's Designs for Temples, and other Buildings, for decorating Pleasure-grounds, Charles Middleton's Architect and Builder's Miscellany, and many others left anonymous (the history of this Library is an issue I am going to expand on). One of this mysterious books is titled Decorations for Parks and Gardens, Designs for Temples, Prospect Towers, Cattle Sheds, Ruins, Bridges, Green Houses, & C, also a Hot-house, a Hot-wall. This one is particularly interesting for us because of its variety: it is a compendium of almost all styles and uses, from gates to seats, from temples to bridges. But looking at the drawings in it we find that some of them don't look like the ones we are used to: in particular the Temple of Neptune is usually modeled on the Roman style in Paestum (a Doric Temple with a rectangular peripteral plan). Here we see, rather, a building whose base is squared, topped with a dome. The Temple of Minerva, or Athena, (the Greek Pantheon is its best known model) is here drawn with a squared base and without its tympanum. It is not even similar to the Temple of Minerva Medica in Rome, often depicted by artists in Eighteenth and Nineteenth Century. The Grand Tour influenced these choices, as landowners desired a copy of what they had seen during their journey across Europe or in Claude's paintings. But, besides its content, another thing got me curious: the debate about its author. 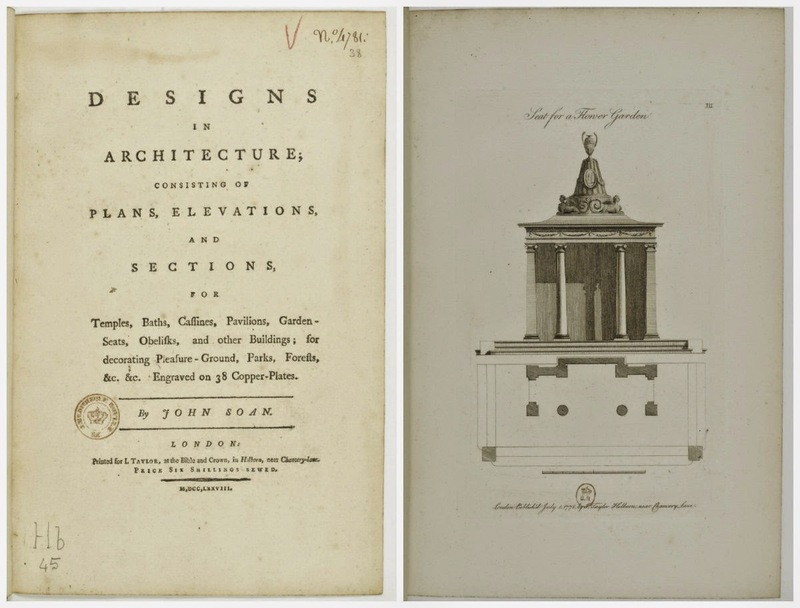 While the publisher left it anonymous (in the book cover as well as in the Architectural Library's catalogue no author is suggested), the British Museum says its author is Charles Middleton, while the Metropolitan Museum (which also possesses a copy) maintains that it is a book by Sir John Soane. Charles Middleton is, for sure, the author of some other essays on garden buildings edited by the same publisher: Picturesque and Architectural Views For Cottages, Farm Houses and Country Villas... (1793), Architect and Builder's Miscellany, or Pocket Library; Containing Original Picturesque Designs in Architecture... (1799) and Designs for Gates and Rails Suitable to Parks, Pleasure Grounds, Balconys etc. (1800). An image from John Soane's Designs in architecture..., 1778. I could not see the first one of Middleton's books, but looking at the other two, they do not seem to demonstrate an affinity with the one I am talking about here. The graphic features in Soane's essay are much more similar to it, but I still have doubts regarding this attribution. Maybe none of them wrote or drew this handbook. It is not even easy to find out when the attribution was made and by whom. The British Library (that I want to thank for their enduring support) reports that in the 1892 edition of the Catalogue of Printed Books in the Library of the British Museum (393 parts) the book is attributed to Charles Middleton but unfortunately "there are no records with the details and reasoning of such curatorial or cataloguing decisions". I am still waiting for an answer from the Metropolitan Museum. I promise I will update this post whenever I receive any news. So the issue is open, if anyone has other information or opinions on the matter, please, feel free to write it in the comment box below. Decorations for Parks and Gardens, Designs for Temples, Prospect Towers, Cattle Sheds, Ruins, Bridges, Green Houses, & C, also a Hot-house, a Hot-wall, from archive.org. John Soane's Designs in architecture; consisting of plans, elevations and sections, for temples, baths, cassines, pavilions, garden-seats, obelisks, and other buildings; for decorating pleasure-ground, parks, forests, etc... (1778), from Bibliothèque National de France. 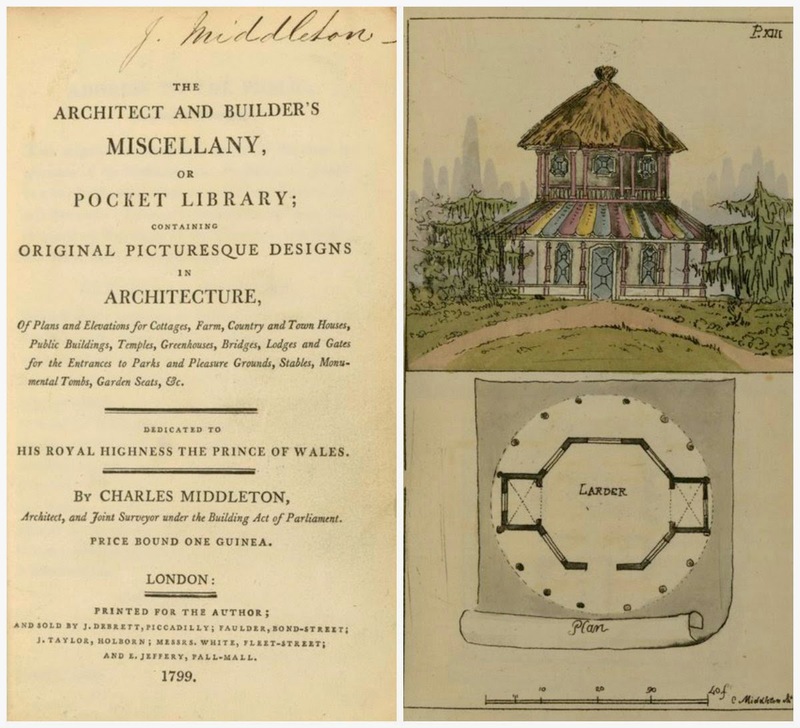 Charles Middleton's Architect and Builder's Miscellany, or Pocket Library; Containing Original Picturesque Designs in Architecture... (1799), from The New York Public Library.